The Granley Deco 4-piece bathroom suite brings elegance to any traditional bathroom with its classical styling. The suite includes a close coupled toilet constructed from high grade vitreous china and features a dual flush cistern with a chrome push button. 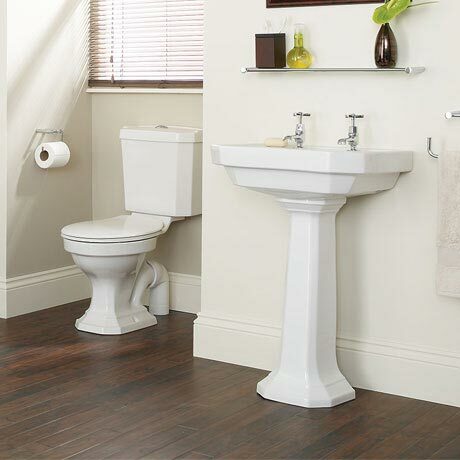 The basin and pedestal comes in an option of 3 various widths to suit small cloakrooms to regular sized bathrooms and features a tall pedestal and 2 tap hole washbasin. All sanitaryware is backed with a lifetime guarantee from Heritage. Please note: Taps, waste and seat are sold separately. All dimensions given are approximate.